While we normally highlight coupons for Costco items that are in-store, today we’re bringing up an item on sale at Costco.com. Through Saturday you can get an Eight Sleep Bliss 10″ Sleep Tracking and Temperature Control Mattress for $100 off. If you’ve been considering trying a memory foam mattress for a while, and you love technology, this is a great time to give it a try. We switched to a memory foam mattress last year, and let me tell you, they’re really comfortable. What sets apart the Eight Sleep Mattress is that it has what they call a technology layer on the top of it. It tracks how much you move at night, your heart rate, and respiratory rate. It also has a dual-zone bed warmer so you can set your ideal temperature for your half of the bed. All of this can integrate with your Amazon Alexa, Google Home, Nest, and other smart home devices. Another awesome feature to the Eight Sleep technology is the smart alarm. 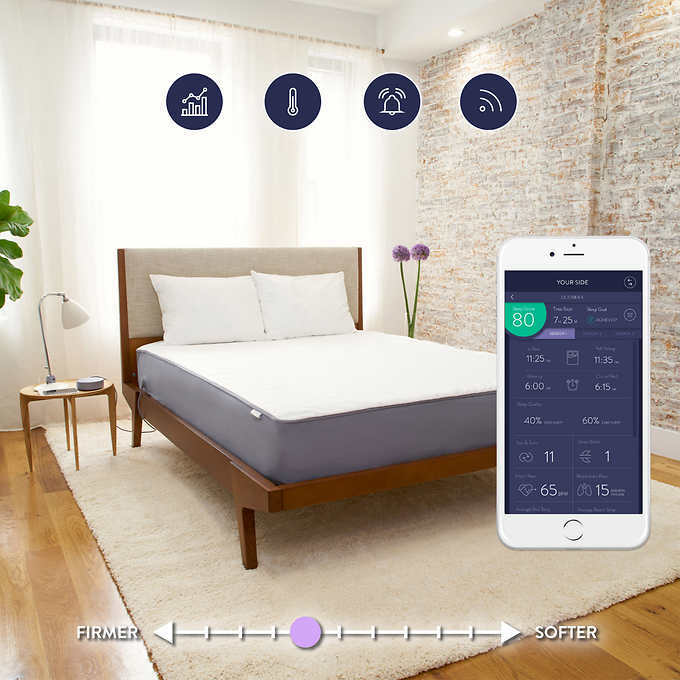 Since the mattress can sense your movement, it knows when you’re in a deep sleep (and REM) or a light sleep. You set a window of time that you want it to wake you up and when you’re in a light sleep it will have the alarm go off on your phone. That way you aren’t woken while deep asleep in the middle of a dream. The benefit to that is you’ll feel less tired when you get up. The warming feature is also much more advanced than any electric blanket you are likely to have now. You can set it on a schedule, such as to have it warm up for 30 minutes at 9:30pm every night (before you get in bed). Another option would be to set it to run for 2-4 hours once you get in bed, but then have it shut off after that so you don’t wake up from being too hot at night. The features on this mattress are endless. You can have it start your coffee in the morning when you wake up, turn the lights off automatically when you get in bed, change the room temperature when you get into bed, and so much more. We could keep going on about it, but you should really check it out yourself! At $100 off it’s definitely less expensive than other leading memory foam mattress companies!